Have you ever had croissant french toast before? If not, I’m about to turn you into a croissant-loving french toast eater. You may remember that french toast and I are on somewhat shaky terms. Shaky, because it’s not a dish that I can have too often. I’ll pretty much take any kind of breakfast dish over french toast…until my cravings strike. And that’s every once in a great while. But, when I smell french toast at a restaurant or get the image in my mind, it means that I need my cure of this breakfast treat. Specifically, the homemade kind, because I can make it to my liking. And my newest french toast? This Cinnamon Banana Croissant French Toast. 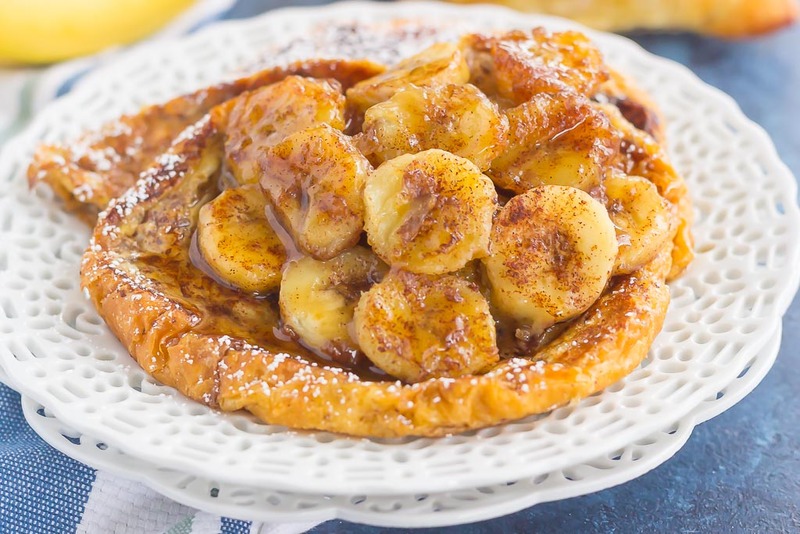 It features thick slices of flaky, buttery croissants that are sprinkled with a cinnamon mixture and topped with caramelized bananas. Simple, fresh, and bursting with a rich flavor, this is the perfect way to switch up your french toast routine! Croissant french toast. It kicks regular french toast to a whole new level. If you’re a fan of buttery croissants like I am, then you’re going to l-o-v-e this Cinnamon Banana Croissant French Toast. Who needs boring ‘ole bread when you can use croissants instead? Am I right? 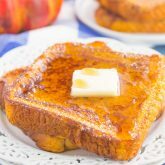 The thicker texture and flaky crust complements the classic flavors of french toast, with a hint of cinnamon. And the caramelized bananas. Swoon! 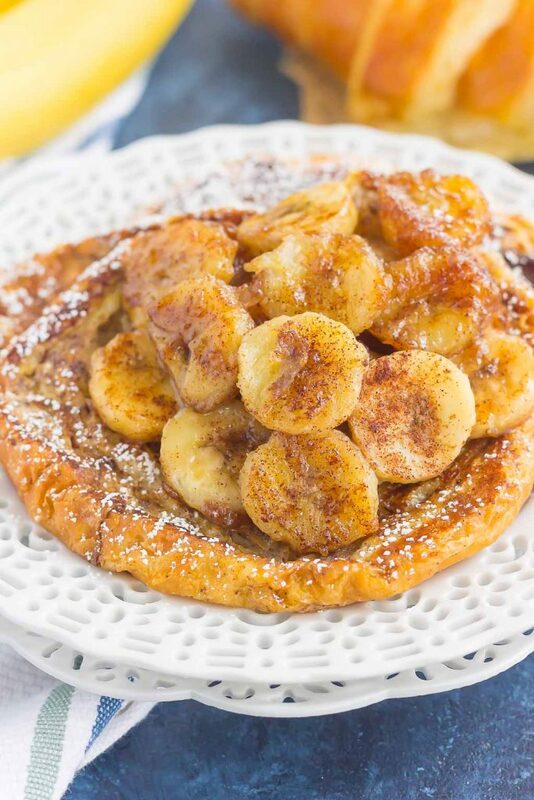 The melted butter, brown sugar, and hint of cinnamon make the bananas extra special. Combine everything together and you have the most decadently delicious, out-of-this-world, crazy good Cinnamon Banana Croissant French Toast. If you’re not convinced that french toast can be delicious, then this recipe will do the trick! 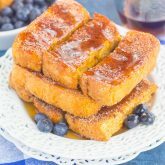 Looking for more french toast recipes? I’ve got you covered! Add bananas, brown sugar, and cinnamon. Stir lightly to combine. Saute for about 2-3 minutes on each side, or until bananas turn golden brown. Remove to a separate plate. Wipe skillet and set aside. In a large bowl, whisk milk, eggs, white sugar, brown sugar, vanilla extract, and cinnamon. Dunk two croissant slices into egg mixture and press to coat. Place onto skillet and cook over medium heat for 3-4 minutes on each side, or until golden brown. Repeat with remaining croissant slices. Serve croissants with caramelized bananas and a dusting of powdered sugar and maple syrup, if desired. I haven't had French toast in forever!! So long. I could just taste this now with the croissant - what a brilliant idea, Gayle! I get along well with croissants, lol, cause they are so rich and buttery. This sounds so decadent and bet tastes awesome with those caramelized bananas. This is the way to start Monday morning, that's for sure :) Pinned! Cheers to a great week! Thanks for the french toast love and pin, Dawn! I think I need to put in a request for this breakfast on Mother's Day!!! Oh my gooooooosh!! Now this is Monday breakfast done the right way! What an indulgent way to do french toast! I'd eat this any morning of the week! Oh gawsh, I could eat french toast every single day of my life if my waistline would allow it! But, I like to fit through doorways, so I try to refrain myself and only indulge when I can't resist the urge! ;) And THIS french toast!? GAYLE! You are giving me ALL the urges to stuff my face with ALL the french toast! I mean, CROISSANTS?! CINNAMON?! CARAMELIZED BANANAS?! Heeeeeeeck yes. I am drooling like a rabid dog over here! Pinned! Cheers, lady! Willpower is hard when it comes to french toast! :) Thanks, Cheyanne! French Toast is one of my favorites and now you've taken it to a whole new level!! So tasty and indulgent! I see this in my (Mother's Day) future!! I'm not a huge fan of plain old french toast either...it needs some pizzazz in most cases! Needless to say, this version has plenty of excitement for me to get on board, namely those caramelized bananas! Croissants definitely make for a much more special french toast and these would be so great for brunch! Now this recipe is definitely the way to cure those shaky terms! Haha. I'm already a big fan of french toast, so these gorgeous pics have me drooling like no other. Especially as I sit here, eating my bowl of oatmeal! ;) This looks incredible, Gayle. You know how much I love my cinnamon and banana combos too... so this has my name all over it. Wishing you an awesome week ahead! Pinned! Thanks, Milena! It's such a nice change from regular french toast! Oh my word, Gayle! It's 8:00 in the evening and I could go for a piece. Lol. 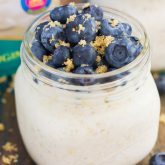 For breakfast or brunch or brinner or dessert! I have never tried a croissant french toast before!! Why have I never thought of this before?? I think you'd love it, Cathleen! I am not a big fan of french toast either but this croissant version is totally brilliant, Gayle! 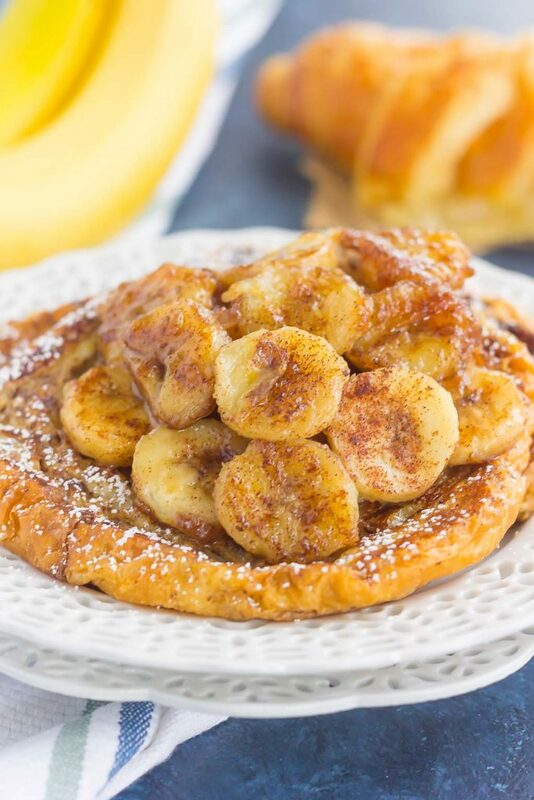 It looks perfect for any Sunday or Mother's Day brunch and I love the cinnamon and banana combo! This is absolute perfection in a plate! What a great idea to use croissants! 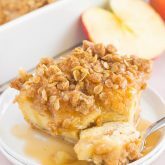 This french toast is a perfect addition to Mother's Day brunch! Ahhh yes french toast though is so yummy but can't have it every day :( - yum! Love croissants this looks like the perfect breakfast (or dessert for breakfast)! So delicious! Pinning to try it! Thanks for the sweet comment and pin, Mira! Oh my goodness, now I want that in my mouth, lol! Looks soo good Gayle! I absolutely love french toast... I'm pretty sure I'd take it over any other sweet breakfast option! I'm much more of a savory breakfast gal, but when I'm craving a sweet one it's always french toast. LOVE this combo you did here, Gayle! 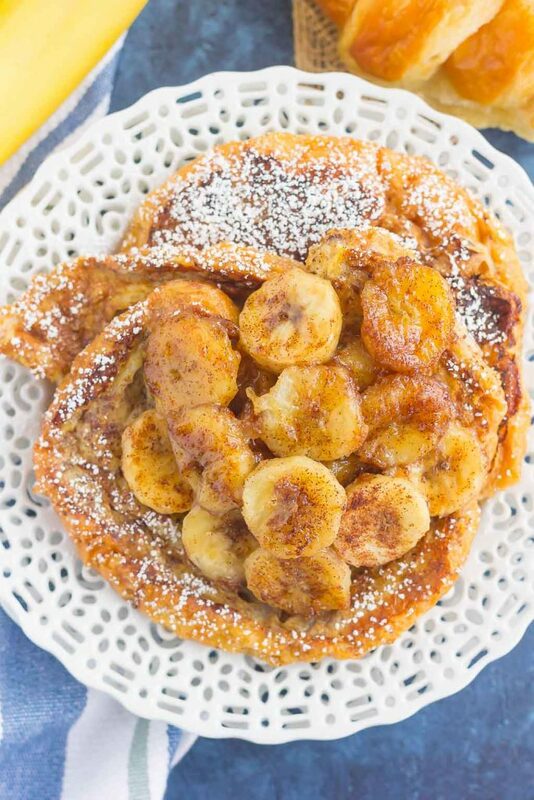 Bananas with cinnamon and croissants?! How delicious!